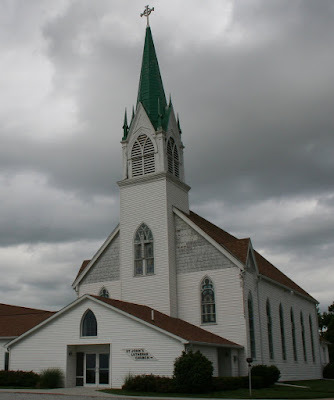 If you're traveling down Nebraska Interstate 80, between the Waco and Utica exits, look to the north; if you're paying close attention you may catch a glimpse of St. John Lutheran church of rural Waco. U.A.C. does indeed mean "Unaltered Augsburg Confession". It was commonly used in the formal name of many early Missouri-Synod Lutheran congregations. This was to distinguish the congregation from other 'Lutheran' congregations which used an altered form of the Augsburg Confession, the primary statement of the Lutheran faith. This altered confession was created early in the 19th century in an effort to unite Lutherans and Calvinists in Germany. (Lutheran teachings on the Real Presence in the Eucharist, baptismal regeneration, and Confession/Absolution were deleted to make the it acceptable to Calvinists.) The Missouri Synod was founded by German immigrants who wished to retain the original unaltered form. Thank you very much for explaining the history of this movement! The church's steeple is adorned with pressed tin shingles and pinnacles. The interior is absolutely fantastic! These photos do a poor job of illustrating the true height of the structure. 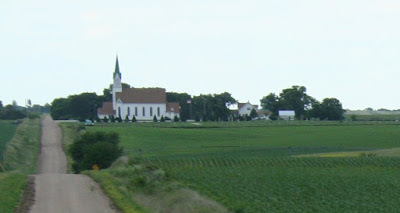 St. John's is certainly a rare jewel among rural Lutheran churches! Particularly unique features are the wrap-around balcony and the pressed tin which covers both the ceiling and walls. Perhaps the most impressive thing about the interior is that it appears to have retained its original appearance for over 100 years. Elevated pulpit and altar in the sanctuary. The altar is very ornate and dramatically lit. Note the wonderful curve on the balcony corners. 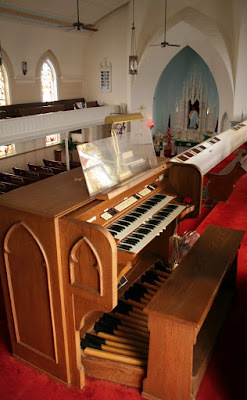 A Reuter pipe organ, dating from 1949 resides in the rear gallery. More information on this instrument, including a stoplist, is available here. 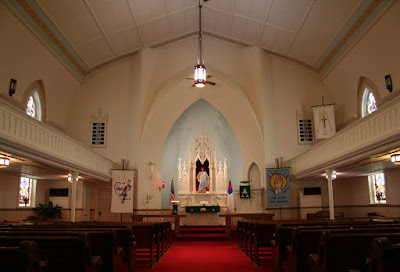 View from the sanctuary toward the church entrance. The organ chamber is to the left. Detail of the balcony railing and side walls. One of the few windows not obscured by the balcony. The windows are mostly geometric designs that feature a particular Christian symbol. What a beautiful church! Ii think that this building is a glory to God! I would like to visit sometime. What a beautiful church! Thanks for sharing. It's awesome to know what U.A.C. means!! @Leona: Yes! It truly is a beautiful place. If you have some time to spare, it is worth making a stop. 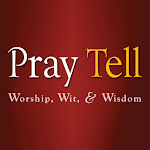 @Pastor Welsh: Glad the information was helpful! Hopefully I'll get around to posting some more Lutheran churches in the near future. My relatives, August Bulgrin and Henry Wellman, were founders of St. John Lutheran Church and are buried in the cemetery. Beautiful church!! This explains why Henry's granddaughter (my grandmother) was such a conservative Lutheran. Thank you for the information on my history.